Looking under the rug, so to speak, can be a humbling experience. Doing so as a staff can be powerful and instructive. We looked under the rug and found some pretty enlightening truths. This article explores how Academic Service Learning can increase students’ intellectual engagement in learning. I am the lucky person who gets to be Principal of Sands Secondary which, by many measures, is a fantastic place to work and learn. As a formal leader of a high school such as this, my job is not to keep the school cruising along at its pretty successful clip, but rather to look closely at what we could be doing to meet the needs of every learner. Looking under the rug, so to speak, can be a humbling experience. Doing so as a staff can be powerful and instructive. We looked under the rug and found some pretty enlightening truths. This article explores the gap we noticed in students’ engagement in their learning and how Academic Service Learning can eliminate that gap. What did we notice when we looked closely? Sands Secondary is, in many ways, typical of most Canadian high schools where kids are generally institutionally engaged but not intellectually engaged; simply put, they behave themselves but don’t actually dig into their learning. Most students at the school perform at successful levels academically. They achieve the marks they need to graduate and many achieve marks necessary to pursue post-secondary learning opportunities. According to results of the 2017 Sands Student Survey, 90% of students indicated moderate to high levels of confidence in themselves as learners. However, 32% of these same learners could not identify at least two adults at school who believed they would be successful. Generally, the majority of students didn’t find their schooling relevant or motivating. Educators also believed the level of learner disengagement has increased in recent years. Many educators felt as though they are competing with electronic devices for their students’ attention. They reported an increasing number of students being distracted by what is going on in their lives outside of school rather than focussing on what they are learning in school. Educators felt as though a growing number of students are struggling with anxiety and depression. Survey results revealed that 25% of learners experience moderate to high levels of anxiety and nearly the same percentage of learners suffer from moderate to high levels of depression. Students shared that when their teachers ask them about their learning, prompt and guide them with feedback, questions, and ideas, they felt as if the teachers think they can achieve at high levels and this leads to increased self-confidence. Students also indicated that in situations where they have had input into the goals, direction, planning and assessment of a learning task, they felt greater ownership and commitment to the task, and greater belief in themselves that they will be able to successfully complete the task at a high level. When students have had the chance to decide how they will represent their learning, they recognized that they can play to their strengths and naturally this boosts their sense of self-confidence. Open-ended challenges allowed them to analyze, problem solve and create solutions that they believe in. Finally, students indicated that they felt they have the confidence and trust of their teachers when they are asked to complete a task that helps other people. Examples of this included preparing and leading an activity with students from a neighboring elementary school, sharing work publicly either during an exhibition or electronically, and peer tutoring in a class of younger or special needs students. Students have a desire for more relevancy in what they are learning at school. Educators sensed a disconnect between what students are learning at school and their lives outside of school. Open-ended tasks paired with teacher feedback contributes to greater learner confidence. Students who participate in service-oriented learning opportunities and/or are asked to share their learning publicly feel as though they have been entrusted by their teachers with a responsibility. Students who initiate and direct their own learning tend to be more engaged and intrinsically motivated. Based on their marks and progress towards graduation, there appears to be a gap between how students perform academically in high school and their impressions of the relevancy and value of what they are learning. Why are so many confident learners who are academically successful by traditional reporting standards not valuing their learning? Hunch: Educators could design more learner-centric learning experiences if they used the OECD Principles of Learning as a way to activate the curriculum. Last year, a pair of teachers acted on their desire to create a more inclusive community and engage students in meaningful community-based learning by establishing a new class called Community Ambassadors. They aimed to create an opportunity for students of diverse intellectual achievements to collaboratively pursue community-service projects. Students enrolled in this class initiated student-directed projects with the intention of helping people in the school and/or local community. 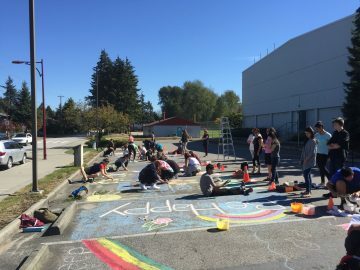 Some of the projects they launched included organizing and hosting a community Blood Drive, raising funds for the BC Children’s Hospital and initiating the ‘Why I Matter’ campaign to build positive images within the student body. The purpose of the course was for students to have an intentional positive influence on the lives and behaviour of others. What makes the Community Ambassadors course unique is that it connects students from Grades 9 – 12 with students who have Special Needs. The course is fully inclusive and enables students of all intellectual levels to work collaboratively and experience success all the while helping others. The course exemplifies the spirit of humanitarianism and volunteerism of the student population. In addition to establishing Community Ambassadors, I posed the idea of an Independent Directed Studies course to three Grade 12 students to allow these students to seek ways to increase students’ sense of belonging. Over the course of the next few weeks the students proposed different ideas to help students become more connected and involved in the school. The students, the school’s Child and Youth Care Worker, and I created an afterschool drop-in recreation program where students of all grades could participate in games, group activities, athletics and other social activities. They coined the program IDEAs, which stands for Inclusivity, Determination, Encouragement, and Altruism. They had a hunch that bringing a diverse range of students together would enable students to meet new people, build new social connections, and gradually increase their sense of connection and belonging within the school. Each Friday, they welcomed between 30 – 75 students, many who attended consistently. Over the eight months of offering the program, the student organizers experienced many challenges, including inconsistent student interest, logistics, and finances. Approaching these challenges with a growth mindset (Dweck, 2008) enabled them to persevere and create a social gathering place that many students looked forward to being part of each week. Although they view their efforts as a start, their interviews of students who participated indicate that the Independent Directed Studies students were tremendously successful in accomplishing their original goal. Sands Secondary After-school Hangout from DSD37 on Vimeo. I was pleased to find that, similar to the students in Community Ambassadors, the three Independent Directed Studies students demonstrated high levels of engagement and intrinsic motivation as they pursued their self-initiated inquiry. There are commonalities between the projects initiated by the Independent Directed Studies students and Community Ambassadors students. In both cases, the initiatives were student-driven with the intention of serving and helping others. The students had an authentic purpose and audience for their work. Student learning was problem-based; problem definition was one of the most important challenges and the open-ended nature of the challenges allowed for a variety of collaborative solutions. Learners maintained a high level of intrinsic motivation largely because they felt a real purpose to their work and ownership of their initiatives. Learners felt pressure and responsibility to follow through on their projects because they had made commitments to other people who relied on them. As is the case with solving any type of problem, learners experienced many setbacks. Rather than viewing themselves as failures, they embraced setbacks as learning opportunities. They learned they must be flexible and adaptable as they evolved their initiatives to better achieve their initial goals. Throughout their projects, their self-confidence and work ethic remained high. The pride they demonstrated in their learning and accomplishments was highly visible and it is clear they were motivated by purpose and not by ‘marks’. Connecting learning in school to students’ lives outside of school promotes student engagement. Thematic, interdisciplinary learning better reflects the challenges that students will face in the world outside of school. Students who have an authentic audience feel a greater sense of responsibility to fulfill their learning. Students who have an authentic purpose to their learning show greater intrinsic motivation and commitment to learning. Problem-based learning promotes the development of core competencies. ntrinsically motivated learners demonstrate greater commitment to learning than those extrinsically motivated by marks. Embedding a research component would enable learners to build greater background knowledge and understanding of the problem and likely create greater impetus for them to pursue a solution. 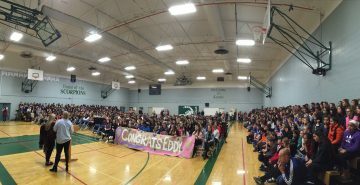 For example, in the Fall of 2016 Community Ambassadors students raised funds for Fast Eddy Canada, an individual who was running across Canada in support of Alzheimer’s and Breast Cancer research. The project was successful in raising funds and promoting awareness for Alzheimer’s and Breast Cancer research. However, I wonder whether students would have accepted more ownership for their fundraising initiatives if their understanding of and emotional connection to the problem at hand were deeper. Another challenge is to connect the student-initiated project ideas to areas of core academic content so that learners gain a deeper understanding of the interdisciplinary nature of the work they intend to embark on. Both Community Ambassadors and Independent Directed Studies students were asked to describe their project work and reflect on their learning by maintaining an individual learning blog or vlog. This is the one aspect of each of the courses that students appeared less committed to. Despite being highly reflective about their projects and their own learning, students hesitated to share their thinking publicly. In order to raise awareness for the initiatives they have undertaken, inspire others to adopt similar challenges, and invite feedback from others, sharing their learning is a critical component. Teachers fel they could have communicated more directly with students about the purpose to sharing their learning and emphasized the requirement to document, reflect on, and share their learning. If the increased emphasis on researching their idea has been successful, students should be able to demonstrate an understanding of the relationship between the respective disciplines and the impact on the whole of their initiative. Learners should also be able to explain the impact of their work on the community. The success of IDEAs left no doubt in my mind that the program must continue next year. Along with the school’s Child and Youth Care Worker and the three students who initiated IDEAs, we began the search for a new group of students who would take on the responsibility of organizing IDEAs. Critical to this process was selecting students who embody the same selfless nature and share a similar desire to increase the level of student connectedness to the school. Five students are currently carrying forward the project into this school year. An important first step for the educators involved is to work with the students to establish a collective mission, vision and goals to act as their guiding light throughout the year. This was a major strength of the graduating team of Independent Directed Studies students and it led to their unwavering commitment to see the project through and accomplish their goals. In order to create a sense of ownership over their work, students must seek to achieve their own mission and vision, and not the mission and vision of someone else. The hope is that the successful elements of the Community Ambassadors and Independent Directed Studies courses can be incorporated into an Interdisciplinary Service Learning Program in the future. The full day program would be scheduled on alternate days of a linear timetable and be open to Grade 10 – 12 students from across the district to participate. Similar to the Community Ambassadors and Independent Directed Studies courses, the Service Learning program will be project-based, student-driven and community-embedded. Learners will use the Spiral of Inquiry (Kaser & Halbert, 2017) to initiate their own collaborative action projects based on their interests in solving real-life challenges that exist in the local and global communities. Students will be required to connect their subject-specific learning to gain an interdisciplinary understanding of the issue they are attempting to solve. Because student initiatives will be embedded within the community, they will be required to identify a community-based mentor whom they can rely on as a resource. The Service Learning Program will attempt to reach the same level of inclusivity as the Community Ambassadors class by requiring that Service Learning students collaborate with students who have Special Needs. The themes are intentionally broad so learners have considerable latitude in identifying a challenge of interest to them. The themes also enable learners to take advantage of an array of physical environments and prominent issues present around them. Although the Service Learning Program will maintain a classroom as a home base for learners, students will spend a considerable amount of time in the community researching information, gathering perspectives, liaising with community members and building solutions. This requires trust on the part of the teacher to allow students to flexibly venture into the community when necessary. Bells, periods and a rotation of classes will effectively be eliminated. Course content will be wrapped around students’ service learning projects and students will still be able to take courses at their home school on alternate days. Students will engage in course bundles and receive credit for the following courses based on their appropriate grade level. If the Service Learning Program is successful, we anticipate the following impacts. A greater percentage of students should be able to identify two or more adults at school who believe they will be successful in life. A greater percentage of learners will find classroom instruction is relevant to their everyday lives and that they are interested and motivated in what they are learning. If students are experiencing academic success, feeling confident and motivated as learners, and seeing relevance to their learning, students in the program will also demonstrate lower levels of anxiety and depression. Since a major component to Service Learning is the development of the core competencies, Service Learning students’ self-assessments of the core competencies should reflect considerable growth. Students will be surveyed at multiple points in the school year. They will also be interviewed at various times so they can provide anecdotal feedback regarding the structure and outcomes of the program. In addition to student interviews, community mentors will be surveyed and interviewed so teachers can gain a better understanding of the growth demonstrated by students in community settings. Educators will also get a feel for the impact of the program in improving the community and the value that mentors feel they have been able to contribute to the learning process. Now Principal of Sands Secondary in the Delta School District, Aaron Akune has been a leader in educational transformation since he stepped into the classroom. He was one of the first to bring EdCamps to British Columbia and is always looking to create space for educators to connect and learn from one another so as to better serve students. 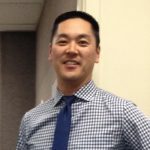 His interests include assessment practices, inquiry-based learning, technology, innovation and leadership. Organization for Economic Cooperation and Development (OECD). (2015). Schooling Redesigned: Towards Innovative Learning Systems, Educational Research and Innovation. Retrieved from http://dx.doi.org/10.1787/9789264245914-en. Dweck, C. S. (2008). Mindset: the new psychology of success. New York: Ballantine Books.